The UCLA Center for Korean Studies is pleased to announce that the 2019 Im Conference of Korean Christianity will be held at 10383 Bunche Hall on April 26 – 27, 2019. The conference aims to give scholars in all Korea-related and world-Christianity fields an opportunity to present their researches on Korean Christianity, especially on the topics related to (1) Christianity in North(ern) Korea (2) Colonialism and Christianity, 1910-1945, and (3) Christianity, Nation Building, and US-Korea Relations, 1945-1965. The papers dealing with the following issues and related issues are to be considered by the selecting committee—(1) Critical issues of Christianity in northern Korea, 1890-1945; Christianity in North Korea, 1945-1988 or 1988-2018; North Korean refugees and Christianity, 1995-2018 (2) Protestantism and colonial modernity; Roman Catholicism and colonial modernity; Christian nationalism and Pro-Japanese collaboration; colonialism and Christian education; and the colonial medical hegemony and Christian medical work. (3) Conflict between Christianity and Communism, 1945-1955; Christianity and the American Military Rule, 1945-1948; the Korean War and Christianity, 1950-1953; Christian Ideas of the Nation, 1945-1955; Christians and the Syngman Rhee Government, 1948-1960, or Global Connections of Korean Christianity, 1945-64. The paper should be one that has not been published in an academic journal or a book yet. The conference is open to doctoral students, postdocs, and junior professors. It is also open to all applicants in the world, but preference will be given to those who are in the US and Canada. Applicants should submit a short CV and proposal/abstract (within 400 words) by December 31, 2018, and the full paper (7,000-10,000 words) by February 15, 2019, to Professor Sung-Deuk Oak. The result of the application will be notified by February 22. Airfare (round trip), accommodations (a single room, 2 nights), and local transportation fees (shuttles from home to airport and LAX to UCLA) will be funded to all accepted participants. All presenters will have a 40-minute talk and 15 minute-discussion session at the conference. 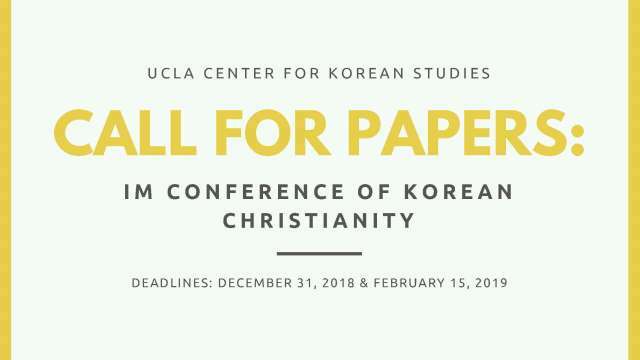 For further information, see the program webpage (http://koreanchristianity.humnet.ucla.edu) and contact Dr. Hyung-Wook Kim, Assistant Director of the UCLA Center for Korean Studies (hyung-wook.kim@international.ucla.edu).